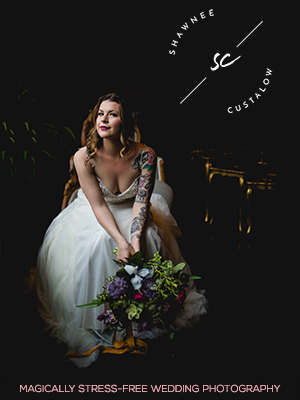 Woke Wednesday // Meet Shawnee Custalow of A Lovely Photo — Catalyst Wedding Co.
Meet Shawnee Custalow of A Lovely Photo, a queer wedding photographer in Richmond, Virginia, who approaches weddings with curiosity and delight. Shawnee: Sure! I grew up in a relatively small and conservative town right outside of Richmond. I'm an only child with a single mom (who has always struggled with lots of issues), so I spent a lot of my younger years alone. My imagination was my best friend as a kid, and I was constantly inventing stories and putting on a performance or show for anyone who would pay attention. I think I was actually way more outgoing when I was a kid than I am now! I was always attracted to any form of the arts growing up, and would seek it out wherever I could. I also love being around other people, and as I got older would surround myself with friends and others whenever possible. I still love the feeling of being around a ton of happy strangers, which is maybe one reason I love weddings so much. Liz: Ah, interesting. It sounds like you have put some thought into connections between your childhood and your work now as a photographer. Do you see a common thread running throughout? Shawnee: Oh yes! (laughs) That exact subject was a project I worked on while in the photography program at VCU. I think spending a lot of time going inward as a kid has definitely given me an interesting perspective. I spend a lot of time looking around at surroundings while I'm working and imagining different ways to photograph my clients with them. Usually putting them in weird places that probably wouldn't make sense otherwise. I also spend a lot of time talking and getting to know the people I'm photographing. I always felt like the awkward kid growing up (I think I'm finally out of my middle-school years now haha! ), and now I always try to make sure they feel comfortable and are excited about the process. I love being around other people and getting to know their stories, and I end up smiling so much by the end of the session or wedding that my cheeks literally hurt. Taking a genuine photo of a moment is such a personal process for both the photographer and the subject. You have to have a lot of trust there, and that's really what I try to make happen with every client. Liz: That sounds lovely. What was the path like to starting your own photography business? Shawnee: I started off doing various gigs for my friends and their friends, while in college in my early twenties. Everything was word of mouth, and every now and then I would do a wedding. The more I shot weddings and engagements, the more I realized how much I loved the process and that I was getting somewhat good at it. Everything stayed word of mouth until a couple years ago I started submitting to blogs, advertising, and booking more weddings. Eventually I was making way more money doing weddings than working my 9-5 at a veterinary clinic. I also just couldn't dedicate the time to my clients I needed when I was working 40 hours a week. I made the plunge and left my full-time job a year and a half ago and haven't looked back since! It is so rewarding being able to work for yourself, and I honestly can't imagine doing anything that I love more. Liz: That's so refreshing. Do you identify as woke, feminist, or otherwise a social justice advocate? What does that mean to you? Shawnee: Yes, to all of the above. I guess the easiest way to put it would be that I treat others with respect, am kind and helpful whenever and wherever possible, and will stand up for those who are in need or can't stand up for themselves. I try to never make assumptions about someone's identity or actions, and make sure to ask questions to genuinely get to know them in order to be mindful about their preferences and needs. I'm a queer woman and definitely view the world through a queer feminist lens. I believe that everyone deserves basic human rights, not just cis-straight white men, and will always do anything I can to ensure that happens. Liz: That's awesome. It seems like you see natural intersections between your photography work and your philosophy.